Using a range of drones, HexCam provides high resolution orthomosaics, Digital Surface Models and high-density point cloud data for topographic surveys for a wide range of applications including civil engineering and construction. We can provide up-to-date and more detailed data than is available from widely-used satellite sources and can complement traditional ground-based surveying and mapping techniques leading to significant and impressive time savings on the ground. Our standard photogrammetry based mapping service produces cloud based orthomosaics with a Ground Sample Distance (GSD) of 2.5cm. The software can produce Digital Elevation Models (DEMs) and Digital Surface Models (DSMs) allowing you to measure distance, areas and relative heights as standard. Outputs can also be tailored to meet your project-specific and individual needs. Despite what many internet-based software companies will tell you, accurate drone mapping without Ground Control Points (GCPs) is just not possible. There are a large number of variables that affect the success and accuracy of photogrammetry including: the camera sensor and lens combination; Ground Sample Distance (GSD); front and side image overlap; the ground speed of the drone and the chosen flight paths, to name but a few. Mapping with a drone and an off-the-shelf app has its uses. For getting a quick up-to-date aerial view of a site and measuring distances to the nearest meter or so, it is a considerably better resolution than free satellite data such as that provided by Google Maps. Illustrated here is the distribution of points from an environmental monitoring project that has spanned a number of months. 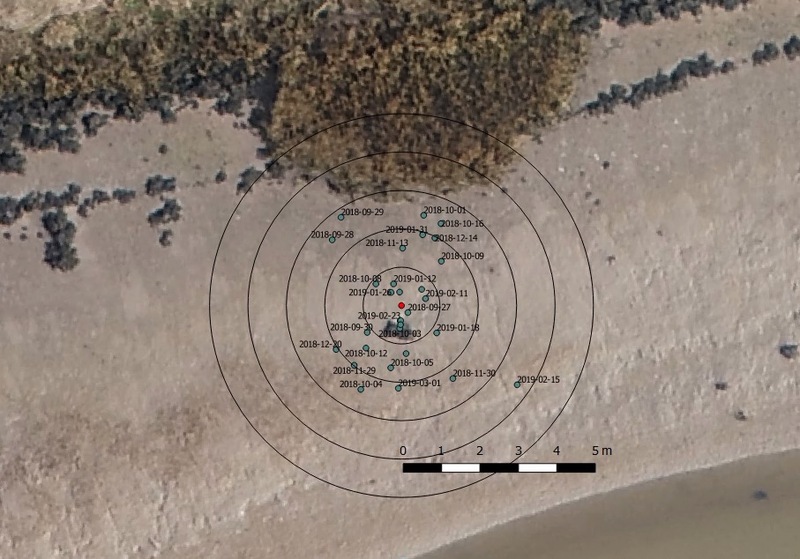 The same survey flight was flown with a Phantom 4 Advance every week and the center point of a known fixed object, in this case a rock, was marked each time. This distribution pattern illustrates nicely the accuracy of a standard GPS unit and, for measuring areas to the nearest 10 square meters, this is perfectly acceptable. It is possible to map and model accurately with a standard drone such as the Phantom 4 Pro. The flight path must be carefully planned and managed to ensure high quality data is captured, and this must be combined with a well placed web of GCPs. GCP placement is absolutely critical to ensure accurate results. 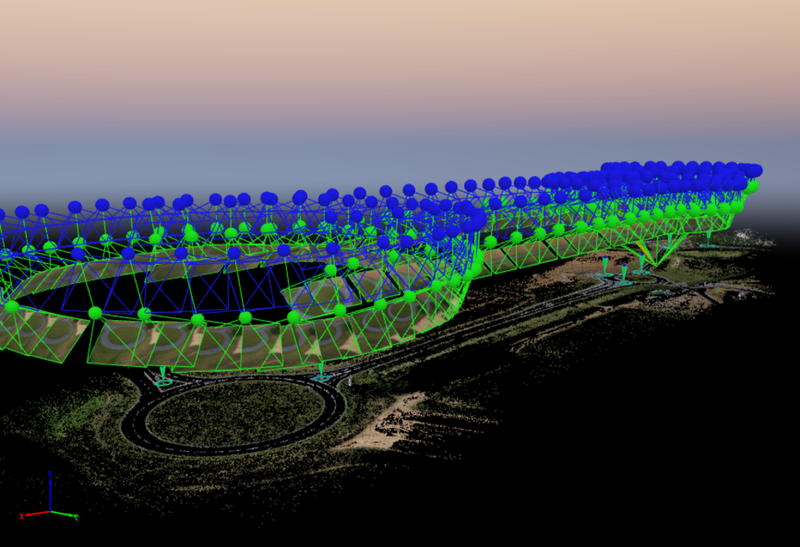 The required number, size, and the distribution of GCPs is dependent on the terrain, the camera and lens combination, the required GSD and the shape of the survey area. The biggest drawback with placing GCPs is that you still have to walk the terrain and mark targets. A 2km by 2km area will require in the region of 25 GCPs laid out in a spiderweb type pattern, and poorly marked or missed GCPs will lead to inaccuracies in that area. The only way to then prove the accuracy of the orthomap or model, is to add a network of Check Points (CPs). The layout of these is less critical than for GCPs and they can be placed in convenient and easy to reach areas. They do however still need placing and marking and both GCPs and CPs will generally need to be collected again once mapping is complete meaning more terrain walking.